It was third day of my Kutch visit in November 2014. We already went to Chhari-dhandh and Naliya Grassland on previous two days. So it was last day of my Kucth visit. We planned to visit the coastal area of Kutch. We visited the Mandvi for that. On previous day Nirav Pomal and Darshit Mehta did Astrophotography full night even though they came with us for the bird photography. 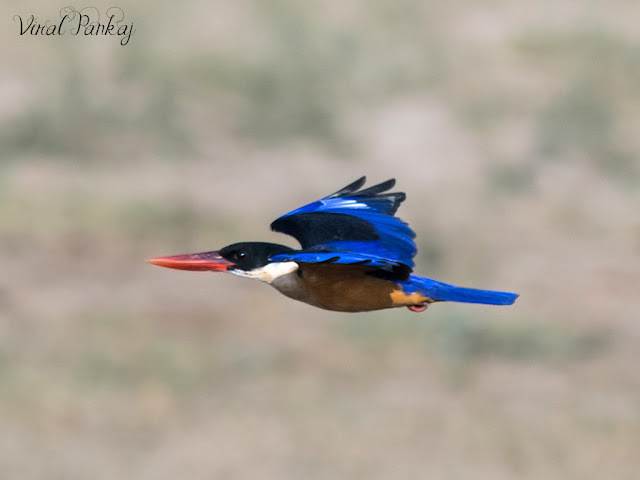 When we were clicking the nearby Grey Heron, Nirav Pomal show us one spot and saying there is kingfisher and we are saying yes it is the kingfisher…! Actually he want to saw us Black-capped Kingfisher but we are looking at White-throated Kingfisher who was just sitting below the Black-capped Kingfisher. After that we decided to go and see what that bird is and finally recognize it as a Black-capped Kingfisher. A lifer for us. It’s a very rare winter migrant in Gujarat form other coastal area of India. In Kutch few records are available.